I wandered into Cherry Pop primarily because we follow RuPaul's Drag Race and because I do appreciate Bob the Drag Queen as an entertainer. I had no idea what to expect from this movie but I figured it was worth checking when it appeared in my Netflix recommendations. 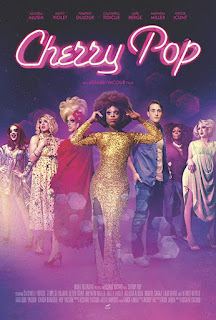 Cherry Pop definitely has the feel of a somewhat older LGBT movie, like during that glut of such direct to video entertainment during the early 2000's or something. In other words, it has some semblance of a story and has a lot of jokes that don't quite seem to land. But at least you have a lot of drag queen cameos that help liven the mood of things, if that's a thing that you look for. But of course it's largely limited to a lot of make-up room sassiness and another opportunities for quipping and all that jazz. I really wanted to like this movie more. Synopsis: Cherry Pop is a 2017 LGBT movie directed by Assaad Yacoub with a screenplay by Nick Landia. The movie is currently available on Netflix. The Cherry (Lars Berge) is what a new performer is called at the bar this movie is set at and he's joined at a turbulent time among the performers. Lead performer Lady Zaza (Tempest DuJour / Patrick Holt) refuses to come out of her dressing room given her depression over the loss of her partner. MC Kitten Withawhip (Bob the Drag Queen / Caldwell Tiduce) typically manages to get her out of these funks as part of his unofficial duties of corralling all the performers every night, but this time may be different. And so our Cherry tries to get ready on-stage while all the other drama is going on among the rest of the queens. Incidentally there's also one other quirk to the Cherry apart from him being new to this club - he's a straight man with a fiancé (Dina Shihabi) - something that the rest of the queens don't take all that kindly to finding out later on. What I Liked: LaTrice Royale (Timothy Wilcots) got to be Terry, a bar patron who is pretty much the most engaged with the show. Thus totally capable of being a heckler one moment and an ardent support another, which isn't too uncommon in performance spaces.Throw in other cameos by RuPaul's Drag Race queens among the backstage crew and you get a lot of fun moments. There was an effort to present something new with the fact that our protagonist is a straight man doing drag for a living. It's not necessarily an uncommon situation but one that is not often explored in oven celebrated in movies. And that was certainly a worthy narrative risk to take. What Could Have Been Better: This movie is terribly boring given awkward pacing, wooden acting and often flat delivery of jokes. There's a lot of instances of waiting for the punchline to sink in but really there's not much to laugh about more often than not. And despite the many talented individuals involved in this production, putting them all together was not sufficient to give this comedy some decent legs. Pacing is really the biggest pain point as a lot of times various bits felt like odd sketch comedy segments loosely strung together. One scene does not flow well into the other and the on-stage performances felt even more disjoint from things. I have no idea what they were thinking when they came up with this story. TL;DR: There were a lot of familiar faces in Chery Pop but you can't make a full comedy out of cameos and bad punchlines. In the end the movie acts as if it has something to say but it really ends up not saying much. And so it gets a passable 1.5 drag performances out of a possible 5.